PVHS offers AP courses and excellent pass-rates in each. Overall, PVHS boast a pass-rate of 80%. The AP program not only enhances students’ chances of College admission and earns students credits prior to their freshman year, but coupled with the block schedule; the AP program better prepares students for the high rigor of university level studies. Palos Verdes High School follows the PVPUSD open course waiver policy in which any student can enroll in an AP course provided that he or she has met the course prerequisites. All students are encouraged to not only challenge themselves, but also take the AP exam at the end of the school year. The PVID, (Palos Verdes International Diploma) program provides a unique opportunity, the only one of its kind in the South Bay, for students to gain additional international education. Students will be enrolled in a variety of AP and honors courses in Social Science, with the goal of obtaining the knowledge and skills needed to be successful in the 21st century. Students will be encouraged to also obtain the College Board’s prestigious Advanced Placement International Diploma (APID), a globally recognized certificate for students with an international outlook. The APID challenges students to display exceptional achievement on AP Exams across several disciplines. Universities worldwide utilize the APID in admissions. National Honors Society is a nation-wide high school organization that recognizes exceptional students who have shown excellence in academics, leadership, service and character throughout their high school careers. One of the most widely respected and distinguished clubs in the nation, National Honors Society not only celebrates a student’s accomplishments, it also encourages members to continue to pursue goals that benefit the community. The Palos Verdes High School chapter does this by hosting the annual Painted Turtle Walk-A-Thon to raise money for a children’s special-needs camp. 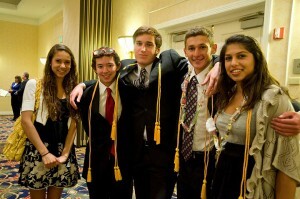 National Honors Society members exemplify the well-rounded student leaders at Palos Verdes High School. The PVHS library has the only certificated school librarian in the district, and she is assisted by a full-time library clerk. As a former English teacher and Reading Specialist, the PVHS teacher-librarian: (1) collaborates with classroom teachers to provide students with resource assistance as they do research; (2) provides students with guidance and lessons in information literacy skills; (3) works with faculty to promote reading for pleasure; and (4) builds a collection of print and nonprint resources to assist students in pursuit of being a life-long learner. The PVHS library prides itself as having the largest collection of subscription electronic databases in our district as well as among neighboring school districts. These databases are the stepping stone to College-level research and enable students to access reliable, accurate and authenticated sources of information instead of relying on the Free Web. The PVHS library is a busy hub on campus and plays an active role in supporting students and teachers with their curricular needs.